Day 18. We made a break for the border leaving our hotel before sunrise with our stash of provisions. After an uneventful journey to the border town of Chetumal we changed buses to the Belizian chicken bus which was to take us across the border. After being fleeced by the Mexican customs for a random amount of American Dollars, a so called “exit tax”, we drove another 15 metres to Belize. We saw the signs informing us of illegal substances not allowed to be brought into the country including fresh produce…we wern’t sure if that included meat and cheeses but to be sure we had a feeding frenzy and consumed our entire days provisions in 5 minutes flat. Our compadre, Willy, casually produced a banana from his bag which he had failed to declare at customs. We’re not sure if this was intentional, but the smirk on his face gave him away. We’re officially travelling in the company of criminals! The bus driver accidentally left one of the passengers (a German business man) at the border. Fifteen minutes into the journey, the German finally caught up with us in a taxi which he’d had to hire and proceeded to hurl abuse at the bus driver. Needless to say, the German did not have a sense of humour! The bus driver, to save a few pesos, decided to switch off the air conditioning for the rest of the four hour journey to Belize City. Locals and tourists alike melted into their seats, most opting to sleep. 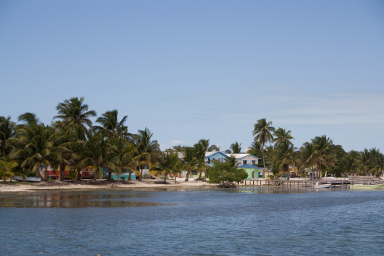 The final leg of today’s journey was a speed boat trip from Belize City to the island of Caye Calker, spiritually home to backpackers, and where lobster is cheaper than chicken and eaten at any time of day.